Okay, I have to admit it. It was a lot of fun playing on Facebook. After a few years of LinkedIn, Facebook feels like a party. It leads to deeper relationships much more quickly and is not about your resume. It is really about relationships. I admit, I believe you must need a sense of humor and perhaps be somewhat liberal and creative in your thinking to really understand facebook. What I think Facebook does extremely well in the "adult" world is to appeal to a demographic which LinkedIn sore misses, "The Creative Class". This class is not about recruiters and jobseekers and vc's. It is about creatively connecting with each other in ways, I could have believed to understand. As much as there are 3 degrees of separation, somehow on day 1, I have become "friends" with Michael Moore, who I admire for his newest movie Sicko. His e-mail address happened to be in my address book, so when I first set up my profile in Facebook, it asked me if I wanted to invite people from my address books. I was able to go in and select people to invite to connect. It turned out that Michael Moore was in my address book. So instead of sending him a long and boring, why do I want to connect, once connected, I "sent him a drink"...yes, there is an add on that allowed me to send him a drink of my choice, in this case. a glass of champagne to toast his new movie. Also, as part of Facebook, you see what groups and other activities people are involved with so you can also join. There was a group for his movie Sicko, so I joined that. I also saw a group called "I love Michael Moore"....Do you know how I found out about it?...I was looking at my profile screen on LinkedIn and saw that Michael Moore (my Friend) had just joined this group. It was right there on my screen. This is somewhat voyeuristic, however, we have a real way to take a peek into other peoples lives. From this screen some friends are traveling by train into London, going to the gym, sleeping off a party, or finishing a project. Another, as found a new band to be a guest for her podcast. A friend from New Orleans has invited me to join her humor club and also sent me a "bite" to become a "Zombie". Again, a funny way to say to someone, let's connect and have some fun while we are doing it. 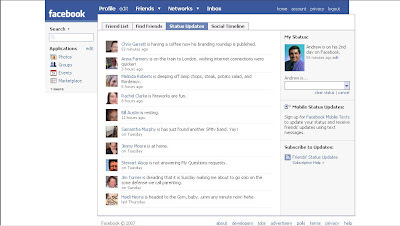 To me, day one on Facebook has been a blast and actually has in some very unique way, helped me to become better friends or deepening relationships, by showing more of my life and personality online.